China’s flagship economic project, the Belt and Road Initiative (aka the New Silk Road), was recently showcased at a global Round-table Summit. In search of new outlets to bolster its slowing export economy and projects to alleviate its massive over-capacity problem, China has been building a belt of railways, highways, pipelines, power plants, and ports throughout central Asia and around the world. In addition to the aforementioned objectives, an enormous portion of China’s imports and exports currently pass through the South and East China Seas, both of which are vulnerable to blockading by the US or other regional powers. While the New Silk Road is billed as a collaborative economic and development project, it has as much to do with China’s strategic security as anything else. 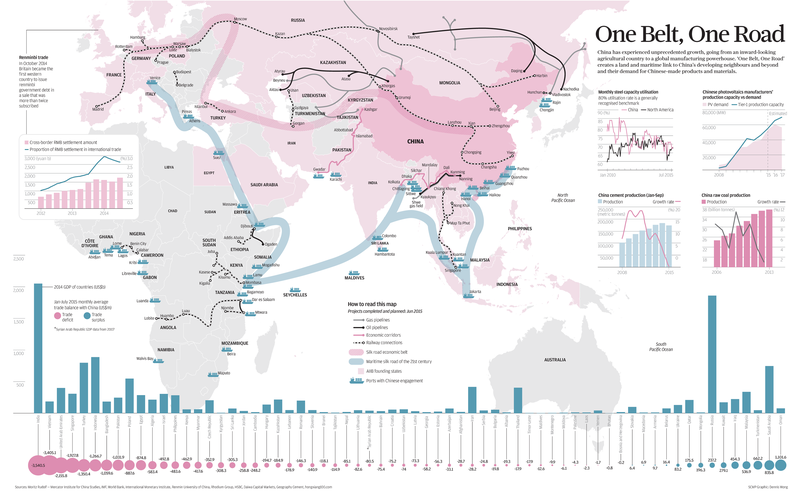 Via the South China Morning Post, here is our favorite info-graphic showing the various projects which make up the Belt and Road Initiative. Enjoy!